2011 was a very successful year for Grandview -- but, there have been a lot of changes at the farm over the past couple of years. 2010 was a quieter year, as Ashley and her husband were a little busy having a baby boy in May, and much of the remainder of the year was spent figuring out how exactly to make everything work with the ever packed line up of horses in training at the farm, and their new little addition, Ben. Thanks to the understanding and co-operation of all of the Grandview family, things are running smoothly now and we're firing on all cylinders again. Little Ben is very blessed to have some amazing Grandview aunts and uncles in his life! Several clients purchased new horses including Wendi Cutts with Royal Rubinero, Gail and Ken Kilgour with Vivaldi, Rene Hugye with R.P. Ruby, Sarah Henderson with Satsuma, and Louise Breau with Caro. 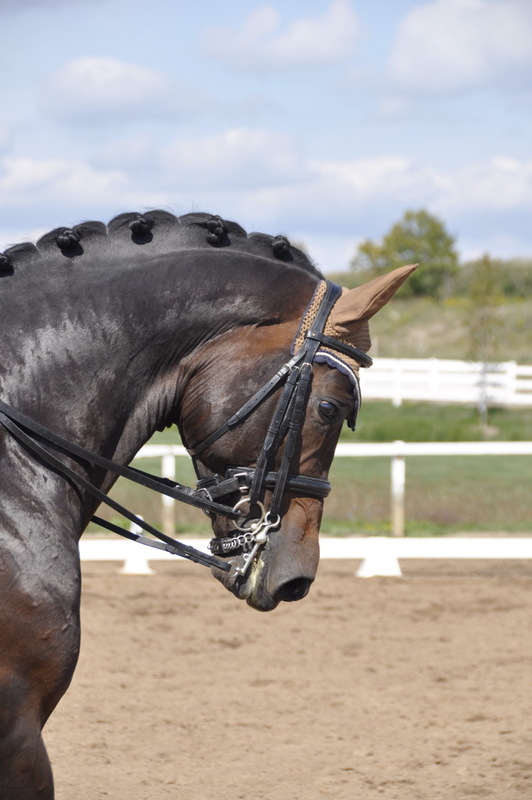 Grandview also purchased an exciting new young Hanoverian stallion in August, 2010 named Rock Brasiliano (Riccione x Matcho AA). The stallion's former trainer, Hartwig Burfeind, has won the last 3 German Professionals Championships, and has grown to be a huge asset and help to Ashley and Grandview, in helping find perfect horses for a few Grandview clients (more on that later! ), and in helping Ashley with Rock Brasiliano through clinics at Grandview, and with the wonders of modern technology, via youtube! Grandview had a very successful 2011 competition season. Ashley, finally, introduced Rock Brasiliano to the show scene, now 7 years ago, he competed very successfully at the Prix St. Georges/Intermediare I level. Although green, and still learning the art of balancing breeding with performance, the stallion showed incredible potential and form, and through trial and error, we learned show by show what works, and what doesn't, in terms of making this incredible stallion's competition career thrive, and with a winter to train, Ashley anticipates the stallion will shine in 2012. He is truly magnificent in every way, but most of all, in temperament. Laura Tweedy and her partner, Ducatti, dipped their feet in the FEI ring, and Laura showed that she has truly become "a competitor". Laura also campaigned Carol Ann Rogerson's mare, Annika II, through her first couple of shows, solidifying the mare's future as a successful show horse. Ashley also showed a number of clients' horses with great success. Wolkendream and Vivaldi, both owned by Gail and Ken Kilgour, R.P. Ruby, owned by Rene Hugye, and Royal Rubinero, owned by Wendi Cutts. Sarah Henderson, with Satsuma and Melanie Vandercrone, with d'Xterity, also made very successful forays into the competition with their youngsters, showing that they have bright futures ahead. Grandview also welcomed its first Rock Brasiliano foal to the farm in July, Rockafella. He is absolutely gorgeous, and is by a mare also bred by Grandview, Reagan (Rosenthal x Donnerhall). We are excited to have been blessed with such an incredible young foal! He'll be something to look for in the future.